Yes, you read that right: six decadent layers of salted caramel and chocolate. Dive in. Preheat oven to 350 degrees. Make the cake: Butter three 9-inch round cake pans, and dust with flour, tapping out excess. Sift flour, granulated sugar, cocoa, baking soda, baking powder, and 1 1/2 teaspoons course salt into the bowl of a mixer. Beat on low speed until just combined. Raise speed to medium, and add eggs, buttermilk, 1 1/2 cups warm water, oil, and vanilla. Beat until smooth, about 3 minutes. Divide batter among pans. Bake until cakes are set and a toothpick inserted into the center of each comes out clean, about 35 minutes. Let cool in pans set on a wire rack for 15 minutes. Turn out cakes onto racks, and let cool completely. Make the caramel: Combine granulated sugar, corn syrup, and 1/4 cup water in a medium saucepan over high heat. Cook, without stirring, until mixture is dark amber, about 14 minutes. Remove from heat, and carefully pour in cream (mixture will spatter); stir until smooth. Return to heat, and cook until a candy thermometer reaches 238 degrees, about 2 minutes. Pour caramel into a medium bowl, stir in 1 teaspoon coarse salt, and let cool slightly, about 15 minutes. Stir in butter, 1 tablespoon at a time. Let cool completely. Meanwhile, make the frosting: Whisk together cocoa and 1/4 cup plus 2 tablespoons warm water in a bowl until cocoa dissolves. Beat butter, confectioners' sugar, and a generous pinch of coarse salt in a clean bowl with a mixer on medium speed until pale and fluffy. Gradually beat in melted chocolate and then cocoa mixture until combined. Let stand for 30 minutes before using. Trim tops of cakes using a serrated knife to create a level surface. Cut each in half horizontally to form 2 layers. Transfer 1 layer to a serving platter, and spread 3/4 cup caramel over top. Top with another cake layer, and repeat with remaining caramel and cake layers, leaving top uncovered. Refrigerate until set, about 1 hour. Frost top and sides of cake in a swirling motion. Sprinkle with sea salt. 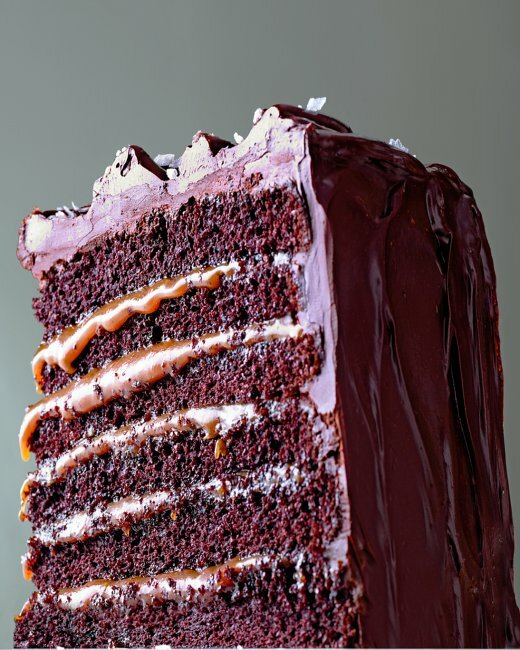 To make this cake ahead of time: The caramel can be refrigerated for up to 3 days; bring to room temperature before using. Cake layers can be refrigerated for up to 3 days (they actually taste better when refrigerated and have a better texture for stacking). When finished, the frosted cake can be refrigerated for up to 3 days.